Our Golf Professional at Eagle Point is CPGA Class “A” Head Golf Professional Jim Fraser. Jim started golfing early in life as a four year old in Dartmouth, Nova Scotia. After moving to Halifax he became a junior member at Ashburn Golf & Country Club where he competed in Club, Provincial and International junior golfing events during his teenage years. Ashburn's New Course was ranked in the top five courses in Canada at the time and hosted the 1980 Canadian Amateur Championship, where no one broke par. Ashburn has stood the test of time and hosted The Nova Scotia Open a Web.com Tour event in 2014 & 2015. After College in Ontario, Jim ventured into the Harness Racing Industry where he developed his training and eventual driving skills against the Nation and the World’s foremost horse people. He raced horses on the tough Ontario Jockey Club big tracks, now the Woodbine Entertainment Group. After the death of his father Jim returned to his first love of golf. He worked very hard apprenticing three years at Sleepy Hollow Golf & C.C. in Stouffville, Ont. He then moved into the role of Head Golf Professional at the famed Markham Golf & Country Club, former home of Canadian golfing greats George Knudson and Moe Norman. Jim competed briefly on the Great Lakes Tour while in Ontario against the likes of David Hearn, Brad Fritcsh both PGA Tour regulars now and Champions Tour regular Rod Spittle. Jim moved to rural Alberta in 2007. He worked as the Head Pro at Last Hill G.C. in Eckville for one year. When the owner sold the family business, Jim moved into the role of Head Golf Professional-Clubhouse Manager at Smoky Lake Town & Country Golf Club growing the game and the club in the small community for a five year period. Jim has over 40 years of golfing experience. He has a Class ”A” designation with the CPGA and has CPGA recognized educational equivalent of a 3-year Business Administration Diploma. 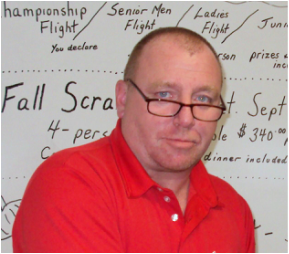 He is a certified level IV instructor with the CPGA and is certified in club fitting & repair, golf rules and handicap system. Jim has recently been elected to serve a two year term as a Director for the Alberta Chapter of The National Golf Course Owners Association. He is the only representative from Northern Alberta.